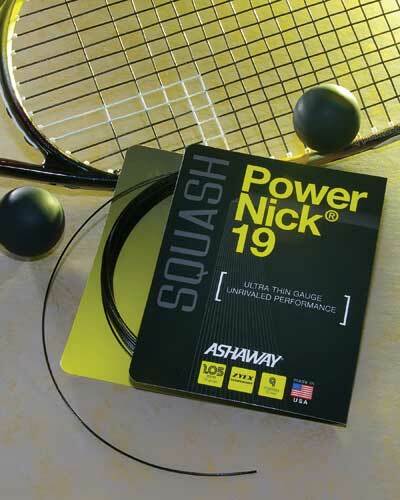 Ashaway, RI — Ashaway Racket Strings has introduced PowerNick® 19, the thinnest string ever to grace a squash racquet. The new 1.05 mm string utilizes a monofilament core, based on a special formulation developed for Ashaway by Zyex Limited. Designed to provide improved power and performance for both amateur and professional players, PowerNick 19 provides excellent resilience and response, along with a dramatic increase in the ability to grip, cut, slice, and work the ball. PowerNick 19’s Zyex monofilament construction prevents tension loss while the ultra-thin 1.05 mm gauge maximizes ball control. The specially designed outer spiral braid provides good gripping action—enhancing spins and slices—while a proprietary outer coating improves stringing and enhances durability. Gloss black in color, Ashaway’s new PowerNick 19 is available in 30 ft sets or 360 ft reels. Ashaway recommends stringing PowerNick 19 up to 30 lbs tension, or about 10-20 percent less than you would string a standard squash string.